Mercedes were the most improved team throughout 2013 as they made infrastructure changes in order to meet the challenges faced by the 2014 regulations. One of their development areas that levied a performance gain was the front wing, therefore it's no surprise to see the WO5 feature a similar design. However with the team taking into account the overall width reduction of 150mm (75mm either side) we see that the wing does bear several differences to it's predecessor. All of these changes are keyed at moving airflow outbound of the front tyre, making up for the loss of surface area. Adorning the secondary section of the Endplate (Mercedes split their Endplate into sections) the team have added a horizontal blade . The wing shaped appendage creates a pressure gradient as the airflow passes over it enhancing the airflow structure created by the footplate below and Endplates it's attached to, all of which help to outwardly turn the airflow. Added to the main cascade we find a new cascade element  which again is aggressively angled in order to turn the airflow outbound. The inner edge of this cascade resides in the same position that was occupied by an 'r' cascade in 2013 who's job it was to enhance the Y250 Vortex. With this gone the shaping of the rearward flaps has been adjusted to mimic it's effect. What is the function of the little 'ball' next to the vertical strake? 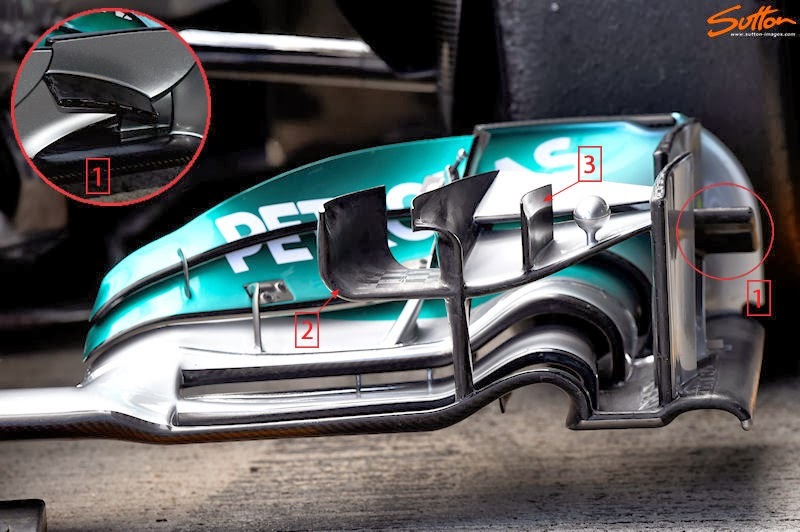 The powers that be claim to want to cut costs in F1 and they still allow these stupid monstrosities of aero appendages, which cost millions to research in the wind tunnel and then to manufacture - many of course needed as the drivers nerf the end bits off in the first corner. Cut aero, including DRS, fit wider tyres and allow the drivers to try and control the resulting mechanical grip advantage over aero and we might just get back to the racing show that used to be. Eliminating aero development is not how one addresses expensive costs, because money can always be spent. A budget cap (properly written and enforced) is the best way to allow technological freedom and ingenuity to reward the smartest and not the richest teams. Agree re budget cap, but my main point was the control of aero development and manufacture, which has destroyed competition and costs a ridiculous amount of money. See articles by Gary Anderson to understand how much the new regs will cost teams in design and manufacture of new rear wings for example. The little ball is a thermal camera. To check tire temps. Somers, could you comment on how you think the different elements (be it front wing, rear wing, exhaust, etc.) will perform comparatively between teams? The same as it has always been, those that have the infrastructure and funds to refine their concepts whilst also learning from those around them will triumph.